It’s time to play! Whether your Wellie Wishers doll™ is going to the playground, on a picnic, or heading back to school, she will be able to do everything she wants to do in her fun, loose fitting, cargo style Playground Pants! Mix and match prints and solids to create your own unique pants. With or without working pockets, these pants are easy to sew and fun to make! Pair it with a cute crop top (like the Popsicle Top) for a casual look, or make them from flannel for a cute Christmas and holiday look! This digital PDF pattern is also ideal to make cargo style pants for boy dolls! These comfy play pants are easily made from 1/4 yard of cotton fabric or lightweight denim and 7 inches of 1/4 inch elastic. (You can also use a fat quarter!). Mix and match your fabrics to create a different look each time. 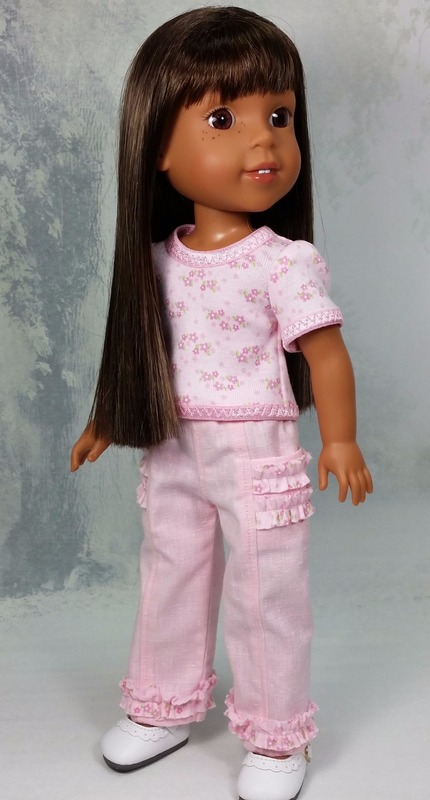 The elastic waistband makes these pants easy for little hands to dress their dolls and the easy construction is perfect for even younger seamstresses to learn to sew. This pattern was specifically designed and tested on 14.5 inch Wellie Wishers ™dolls made by American Girl®. It will also work for Hearts for Hearts Dolls. Not all dolls, even of the same brand, are exactly the same size. Be sure to measure your Playground Pants on your own doll as you go along to ensure a perfect fit. I love these pants. I added ruffles and they turned out adorable. Enjoyed making these. I made 2 pair and they both turned out great. Easy to do. This patter goes together so quickly. They are adorable with or without pockets and with our without contrasting panels. I love these little Playground Pants from OhSewKat! This is a great pattern. Easy to follow and I recommend it to all.